"These percale sheets are top-tier in terms of fabric and craftsmanship, and they’ll make you feel as though you're sleeping in a 5-star hotel every night." "They feature a thread count of 300, and the pocket on the fitted sheet can fit mattresses up to 16 inches deep." "This four-piece sheet set is made from 100% Egyptian cotton, and you'll feel like you're sleeping on a cloud every time you climb into bed." "You can choose from more than a dozen colors, including pink, purple, red, blue, yellow, and more." "This four-piece sheet set is made from 100% Egyptian cotton and has an impressive thread count of 1,000." "Reviewers absolutely love how crisp, cool, and absorbent these sheets are, writing that they’re perfect for hot summer nights." "These crisp percale sheets maybe plain to behold, but they deliver big in terms of comfort." "You can choose from three plain colors and between queen, king, or California king sizes." "Consider the Superior Sheet Set, which boasts an impressive 1,000 threads per square inch." "The extra-deep pocket is designed to fit mattresses up to a whopping 24 inches deep"
For a pair of highly-rated, 100% Egyptian cotton sheets, you can't go wrong with the SFERRA Grande Hotel Sheets. These percale sheets are top-tier in terms of fabric and craftsmanship, and they’ll make you feel as though you're sleeping in a 5-star hotel every night. The SFERRA sheets come in twin, full, queen, king, and California king sizes, and you must buy the flat sheet, fitted sheet, and pillow cases separately. These sheets are only available in white, but the flat sheets and pillowcases are embroidered with a double row of satin stitching in various colors for a chic accent. If you're wondering whether these sheets are worth the premium price tag, check out their glowing reviews. Happy users say the sheets are crisp, yet soft and luxurious, and many note that the pocket is deep enough to fit a thick mattress. Most Egyptian cotton sheets cost $100 or more, but you can find the occasional budget pick if you know where to look. For instance, this Egyptian Cotton Sheet Set from Walmart is quite the steal, as you get a four-piece sheet set made from 100% Egyptian cotton. These sheets come in twin, full, queen, king, and split king sizes, and there are several plain colors to choose from, including white, taupe, dark blue, and gray. They feature a thread count of 300, and the pocket on the fitted sheet can fit mattresses up to 16 inches deep. Overall, they’re a quality product at a fraction of the price. If you're willing to splurge on a high-end product, look no further than the Signoria Firenze Raffeallo 300 Thread Count Sheet Set. This four-piece sheet set is made from 100% Egyptian cotton, and you'll feel like you're sleeping on a cloud every time you climb into bed. These sheets are made in Italy and have a lustrous, silky sateen finish that's smoother to the touch than percale options. The thread count is 300, and the fitted sheet pocket can fit mattresses up to 17 inches deep. There are several neutral colors to choose from, as well as queen, king, or California king sizes. For the ultimate luxury sleeping experience, these Egyptian cotton sheets fit the bill. You may have noticed that many Egyptian cotton sheets come in either white or very plain colors. If you're looking for a brighter sheet set to lighten up your bedroom, perhaps the best color selection comes from the Chateau Home Collection. These 800 thread-count Egyptian cotton sheets come in full, queen, king, California king, and split king sizes, and you can choose from more than a dozen colors, including pink, purple, red, blue, yellow, and more. The sheets have a smooth sateen finish, and the fitted sheet can accommodate mattresses up to 15 inches deep. Reviewers rave about the quality of these sheets, writing that they're soft, thick, and luxurious. Not to mention, they're a great value for the price, costing significantly less than many comparable products. Similar to how Egyptian cotton sheets don't come in a lot of colors, it's often hard to find a pair with a pattern. The closest you'll probably find is this set from AQ Textiles, which features a subtle Bergen stripe. This four-piece sheet set is made from 100% Egyptian cotton and has an impressive thread count of 1,000. The fitted sheet can accommodate mattresses up to 18 inches deep, and the sheets have a silky sateen finish with a subtle striped pattern. You can choose from several colors, including vibrant blues and reds, and reviewers say the sheets are soft, thick, and comfortable like those in expensive hotels. Many high-end Egyptian cotton sheet sets only come in queen and king sizes, but why shouldn’t you have great sheets for your full or twin-size bed? Luckily, the Ultimate Percale Egyptian Cotton Twin Sheet Set makes great sheets available to all, as it comes in not only twin and full sizes, but twin XL and full XL, too. 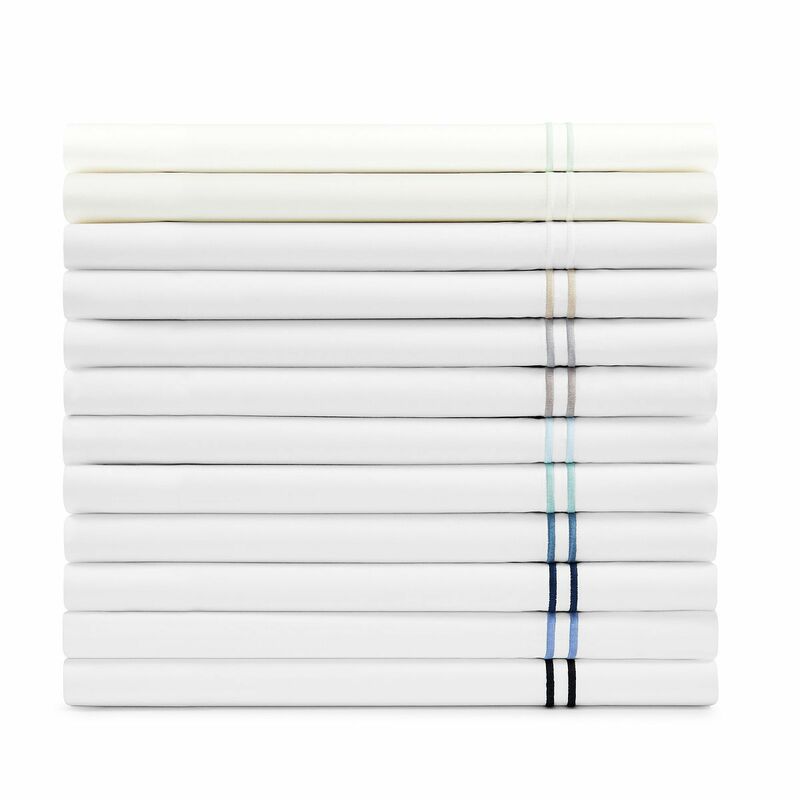 This three- or four-piece sheet set has a percale construction for a crisp, cool finish, and it comes in several pretty colors. The thread count is 400, and the sheets can fit mattresses up to 18 inches deep. Reviewers absolutely love how crisp, cool, and absorbent these sheets are, writing that they’re perfect for hot summer nights. The term percale refers to the way a sheet is woven—this particular weave follows a standard pattern where each thread goes over one yarn and under the next, resulting in a strong, durable fabric that’s crisp to the touch. If you're looking for a set of Egyptian cotton sheets with a percale weave, one of the best products out there are the SFERRA Anello Sheets. These crisp percale sheets maybe plain to behold, but they deliver big in terms of comfort. The sheets are white with a double line of golden stitching along the edges, and you can get them in twin, full, queen, king, or California king sizes. The various pieces are sold separately, so you can pick and choose what you want, and the fitted sheet can be put on mattresses up to 17 inches deep. Reviewers call these high-end percale sheets “pure luxury,” saying they’re wonderful to sleep on and deep enough to accomodate a pillow top mattresses. Sateen is another popular fabric construction for sheets, where each thread is woven over several perpendicular yarns at a time. This results in a smoother, silkier finish, as opposed to the crisp hand of percale. The downside of sateen sheets is that’s they’re more prone to pilling, so you must care for them properly to increase their longevity. Some of the best sateen Egyptian cotton sheets available are from Nordstrom at Home. The sheets, which are sold as separate pieces, have a 600 thread count and are made from 100% Egyptian cotton. You can choose from three plain colors and between queen, king, or California king sizes. According to reviewers, these sheets “make your feet and legs really happy when you get into bed” thanks to their soft, smooth finish. Plus, many note that the sheets are breathable and easy to care for. A common way to measure the quality of sheets is by their thread count. This measurement refers to how many threads are in each square inch of the fabric, running both vertically and horizontally. Higher thread counts often mean softer, stronger sheets, which is why luxury products often have a thread count of 600 or more. If you're looking for Egyptian cotton sheets with a high thread-count, consider the Superior Sheet Set, which boasts an impressive 1,000 threads per square inch. The four-piece set comes in 10 different colors, as well as full, queen, king, California king, and Olympic queen sizes. The sheets are made from 100% Egyptian cotton and can fit on mattresses up to 18 inches deep. Thanks to their sateen weave paired with such a high thread-count, you're in for an absolutely luxurious sleep experience—for a reasonable price. Some pillow top mattresses are extremely deep—sometimes measuring 20 inches thick or more. If you struggle to find sheets that are deep enough to fit your mattress, you need a product like the Tribeca Living Egyptian Cotton Solid Sheet Set. This four-piece sheet set is made from 100% Egyptian cotton for the soft, strong fabric you love, and the extra-deep pocket is designed to fit mattresses up to a whopping 24 inches deep—if these don’t fit your bed, we don’t know what will! You can choose from several neutral colors, as well as queen and king sizes. The sheets are made of a sateen weave, and the fabric has an impressive 800 thread-count, to boot. Reviewers write that the deep pockets on these sheets are a lifesaver, fitting on even the thickest mattresses with ease. Plus, most agree that they are very luxurious and comfortable to sleep on. Our writers spent 2 hours researching the most popular Egyptian cotton sheets on the market. Before making their final recommendations, they considered 20 different sheets overall, screened options from 15 different brands and manufacturers and read over 35 user reviews (both positive and negative). All of this research adds up to recommendations you can trust.